It's a white ball point pen. Bic I believe? If you roll it 1/4 turn towards those nuts that you found I can tell ya. Looks a lot like a hickory hull to me, but it is hard to tell. It will be a lot easier to identify when green ones start to drop in the next several weeks. Randy, I don't recall the pens being complimentary...shame on you. Shagbark Hickory, just wasn't sure if they were that far south. Pignut and shagbark will cross winding up with some tough to identify nuts. Primarily a pignut has a *very thin* husk and a puny nut, where a good shagbark has a medium/thick husk and relatively large tasty nut. Takes a lot to crack them and make a tasty pie. Like said it will be a lot easier to identify when they are fresh. 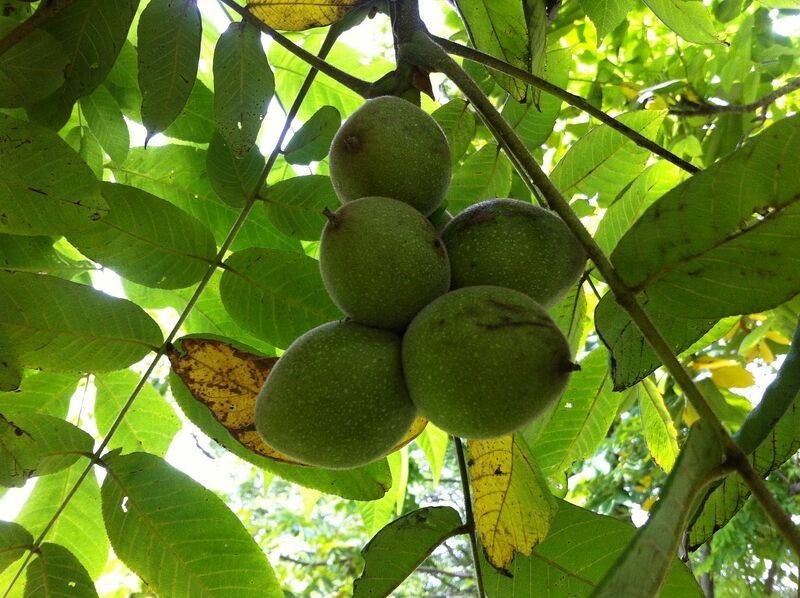 A good hickory nut is light tan, woody, and round when fully matured with a sharp tip on the end away from the stem. Approximately 1" I have both on my land, but mostly the useless pignut (but very good burning). 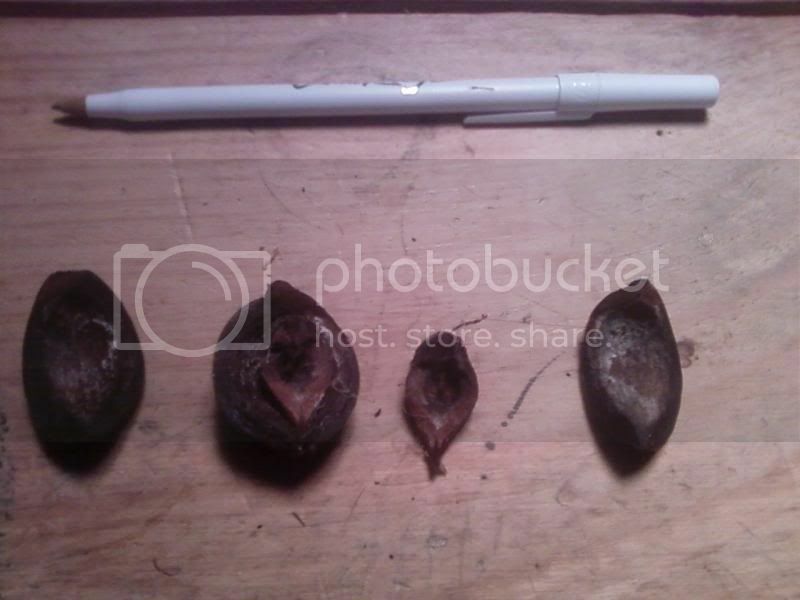 While the husk looks very hickory, the nut I think is immature or unfertilized making it look pignut-ish. My thought is a hickory nut too. More trivia: Not every Hickory will have nuts that are worth fooling with. Never collect nuts without cracking a few open first, just to check them out. Or, watch the squirrels....the hickories they are in FIRST, are usually good trees. I fixed my post above, that will teach me to reply to forums before my eyes are opened all the way. 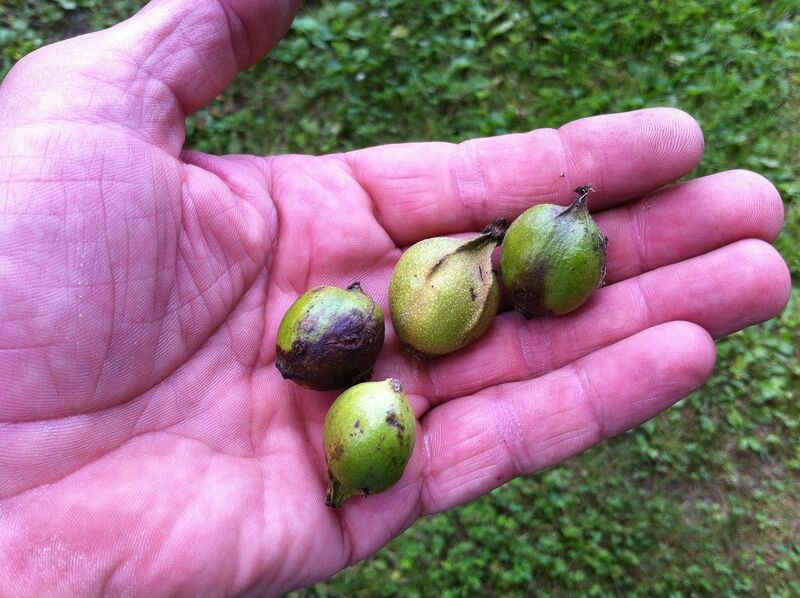 As sprkplug mentions, there are a few varieties of hickory, all nuts are not created equal. Pignut for example is very bitter and downright nasty. The squirrels will eat them though, so not the greatest indicator. Hickory are tough as hell to get into, but the sweet centers are worth the effort. A squirrel will work at them for quite some time since they are so tasty. You have to be ever vigilant under a shagbark to get the nuts before the squirrels do, along with American Chestnuts (if you can find them). AAAAAHHHHH, squirrel season. The smell of gunpowder in the morning. Not when you use one of these! 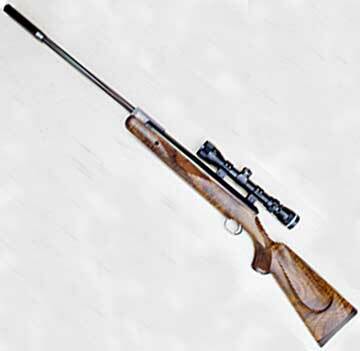 I used to hunt with a .22 caliber break-barrel myself....lots of fun. That one is .177. Head shots only or they run off and are hard to recover. It works exceptionally well! I grow pecans for a living and that is not a pecan but defiantly in the hickory family. In my orchard we don't want to miss so we use a 12 gauge no choke, and 6 shot. That way you can get the little thief on the run. We killed over 600 last fall, and will be dusting off the guns agin in two weeks. Cray, 600 tree rats is insane. How many acres/trees do you have? Sparkplug, I appreciate your ol school attitude. I started huntin with a single shot 22 that my uncle gave me. I learned how to be patient and wait for a head shot, no wasted meat. Mom would give me "the look" if I brought home anything with muscle damage. No one likes ta pick out shattered bone, imbedded hair or small bb's while enjoying a nice meal any more than having a fishbone jammed between yer teeth. I remember when these trees produced their first crop....the squirrels went wild for those thin shells. I killed five out of one tree in the space of 10 minutes. They simply could not leave the tree alone. I would drop one, the rest would scatter, but they would come right back. Every one I killed had its chin and chest soaked from the juice in the hulls. I hear you Bob-O.....it was the same in my family. No shattered bone, and no picking fur. My youngest wants to go this year, and he's pretty tough with his .410, but his older brother, (and dad) prefer a .22....probably going to cause trouble. Still walking around the yard with my phone. It is amazing what you can learn in a forum about ponds. I'm so glad this question was asked, because I love to hunt squirrels, and I love to forage around for edible parts of God's creation (ramps, berries, etc). I tried pig nuts in the past thinking they were hickory nuts...and couldn't imagine why anyone would eat that thing. 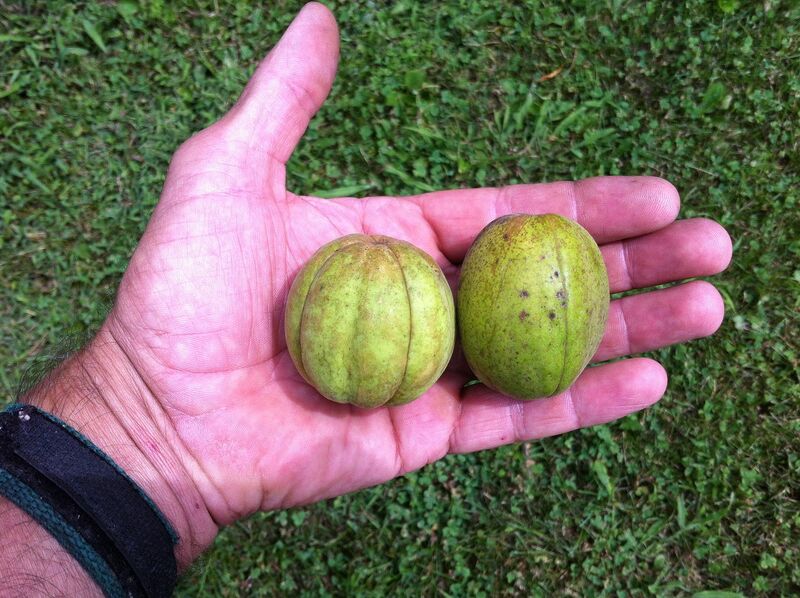 I can't wait to crack open some of the shagbark hickory nuts on our place and try them! And...they are the first trees the squirrels raid.